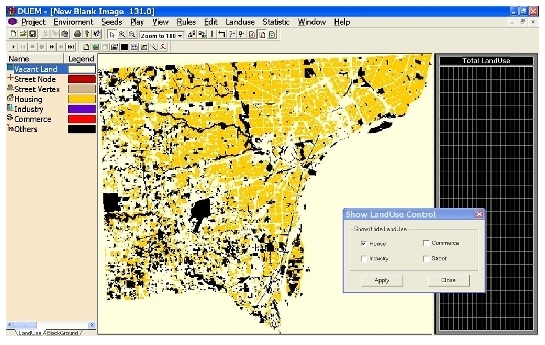 Yichun Xie who is the Director of The Institute for Geospatial Research & Education (IGRE) at Eastern Michigan University developed this software in the late 1990s. The model is based on his PhD thesis work at the NCGIA at SUNY-Buffalo where his supervisor was Mike Batty. He worked on this version of the model with Michael Batty and Zhanli Sun who wrote the program. DUEM means Dynamic Urban Evolutionary Modelling and is based on the cellular automata approach to urban modelling. You can download our CEUS paper here about the model and this software and there is also material in the Michael Batty’s book Cities and Complexity. This software enables the user to run a variety of different cellular automata on a 2-D landscape that they can populate and constrain in various ways. First off, the software lets the user open a blank canvas of up to dimension 3000 x 3000 but ideally users should keep it smaller to something like 300 x 300. One can also import a raster backcloth from various files. There are some five land uses that are simulated – housing, industry, commercial, vacant, and streets (with street nodes that are necessary for streets to develop). There are a whole range of default rules that you can access buy clicking on the land use legend to change the influence of a land use on its neighbours, in neighbourhoods of varying sizes, life cycle effects that simulate how land uses affect other land uses dependent on how old they are, directionality of influence of a land use on the 2-D grid , and the decay of influence according to different distance functions. The easiest way to begin is to populate the landscape with a set of randomly located land uses and then simply watch the system grow. As the system is capacitated, then it will grow logistically but because there are various leads and lags it will cycle around upper limits. One of the key features of the software is that it lets the user figure out whether or not the long term dynamics is feasible given the local default rules. Of course rules can be changed at the start or on the fly. There are many possibilities and one nice feature is that it lets user explore small cellular systems of say 20 cells by 20 so that these insights can be developed manageably. The screen shots on the right and below show how the populations and land uses grow to capacity and then cycle and how the distribution of land uses changes dynamically through time. There is a lot of material out there on cellular automata models. read Michael Batty’s paper Cellular Automata and Urban Form: A Primer, Journal of the American Planning Association, 63, 266-274, 1997 which you can get by clicking on this link.